Material selection, when selecting the most appropriate adhesive tape or interface material, careful consideration must be given to ensure the correct product is specified. We show here some of the parameters that need to be identified. Physical requirements: mechanical strength, thickness, colour, adhesion strength. Removal from sensitive skin can be painful ; need to select appropriate type of adhesive. Polyethylene (PE), Polyurethane (PU), Polyester (PET). Aspects to consider when choosing a tape backing: softness, elasticity / conformability, porosity, easy tear. Hydrocolloid adhesives are complex polymeric structures that provide skin adhesion and moisture absorbency whilst being both conformable and breathable, making them ideal for device fixation, ostomy and wound care applications. Pronat offers Hydrocolloid materials manufactured by Avery Dennison’s Vancive medical division which provide a wide range of adhesion and fluid handling capabilities. These materials are highly suited for skin fixation applications where the material must be left on the skin for long periods of time. Hydrocolloids are available as single sided tapes with a PU film or non-woven materials on one side or as double sided pressure sensitive adhesives. Hydrogel adhesives are gentle conductive water based pressure sensitive material which provides a very good initial adhesion to skin. A high level of water content in hydrogel ensures excellent electrical conductivity. Pronat offers a range of Axelgaard & 3M hydrogels for ECG and other sensing applications. Hydrogels are also suitable for skin fixation where repeated applications to the skin are required. Connecting sensors and electrodes to the body. Can be used as replacement of ultrasound gel. This is a gentle conductive adhesive that can be used for fixation or protective cushioning. It offers very good initial skin adhesion. This is available in a range of products and its special multilayer design offers uncompromised performance and adhesion to the skin as well as an optimal bond to backing materials. Axelgaard’s MultiStick® technology also allows multiple applications to the skin and ensures maximum durability, longevity, and performance for any hydrogel adhesive application. Hydrophilic films allow for fluid transport along the test strip in the desired direction. It provides a consistent thickness and flow of the test sample. Pronat offers a wide range of single and double sided medical adhesive tapes. They are sourced from some of the world’s leading manufacturers, such as 3M Medical Specialties, Avery Denisson’s Vancive Medical Division, Adhesives Research and SCAPA. All of Pronat’s medical materials are biocompatible and suitable for direct skin contact. The selection of a suitable tape will depend on your requirement of tape thickness, material combination, sterilization method, durability, conformability and other specific needs of your application. We therefore offer an extensive range of options, in order to provide the most suitable product for your application. Pronat offers a wide range of single sided, skin contact, medical grade adhesive tapes. Biocompatible acrylic, rubber and silicone adhesives. 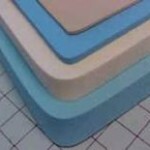 Substrates include PE and PU foams, PE and PU films, non-woven and fabric materials. Breathable and absorbent products for sensors, patches and devices that must remain on the skin for both short and long term use. Medical grade double sided tapes for a range of skin contact applications including device fixation and adhesion assembly solutions for medical devices. 3M 1772 1.7 mm PE foam tape. 3M 1774 0.6mm PE foam tape. MED 6650 Double coated PE foam tape with “Wetstick” rubber adhesive on one side for skin fixation and acrylic adhesive on the other for device fixation. Pronat offers a range of medical grade foam and silicone rubber materials. We supply sealing materials for applications in medical devices and biocompatible materials for use in direct skin contact. Roger’s PORON Medical® cellular urethanes – These find a wide use in orthopedic and prosthetic devices, including padding and biomechanical supports. Biocompatible, non-irritating, non-toxic, direct skin contact. Varying levels of conformability on skin. Different levels of water resistance, water absorption. We stock a range of biocompatible and FDA approved textiles. Those special textiles include non-woven, woven or knitted polyester fabrics, PTFE felt and mesh materials. These are used in a variety of applications, such as orthopedics, cardiovascular and general surgery, for one time or repeated uses. Custom-made textile parts are produced using various techniques, such as high frequency and ultrasonic welding, sewing or adhesive bonding. Pronat’s display enhancement films and diffusers improve the visual appearance of medical device monitors and displays. They offer a variety of solutions for improved readability, increased brightness, excellent contrast and color uniformity, glare reduction, privacy, and portability all maximizing user readability. BEF – Vikuiti™ Brightness Enhancement Films are transparent optical films that increase LCD brightness through improved management of the existing light. ESR – Vikuiti™ Enhanced Specular Reflector (ESR) is an ultra-high reflectivity, mirror-like optical enhancement film. Diffusers – Pronat’s diffusers improve the visual appearance of electronic displays and offer a variety of solutions for LCD applications. LSD – Light shape diffusers offer superior optical transmission between 200nm and 1500nm. Depending on the angle of distribution, LSDs will achieve between 85% and 92% transmission efficiency. SP-2390 is a series of high-purity, platinum-catalyzed, translucent silicone elastomers that are FDA CFR 177.2600, USP Class VI*, and RoHS compliant. icone elastomers comply with FDA CFR 177.2600 requirements for rubber articles that are intended for repeated use with food. These platinum cure silicones also comply with USP Class VI requirements for compounds made from components with ingredients with clear histories of biocompatibility. SSP-2390 silicone elastomerics also comply with the European Union’s Restriction of Hazardous Substances (RoHS) Directive 2002/95/E. SSP-2390 silicone elastomers are translucent in color (custom pigment also available) and are supplied as a ready-to-mold compound or compression-molded sheet stock. SSP can also produce continuous rolls from .005 to .125 inches thick. All SSP-2390 silicones are platinum-catalyzed and have an average shelf life of six months. Cold storage will extend shelf life. Raw materials are ready for press-cure molding. SSP-2390 silicone elastomers are available in 10, 20, 30, 40, 50, 60, 70, and 80 durometers. Further information is available for tensile strength, elongation percentage, tear resistance, specific gravity, and cure profile for each durometer. The human skin is the most important barrier to infection. In order to ensure maximum wound care and the prevention of I.V. site device related infections, Pronat offers custom-made wound care dressings and transdermal delivery products. We use materials solely produced by the world’s leading manufacturers to meet our customers specific requirements. Scotchmate® and Velcro® fasteners are widely used where re-closeable fastening solutions are needed. The male-female parts easily bond together. These re-closeable fasteners are available with various sizes of hooks and loops, suitable for different degrees of tensile strength and come in different colours. We offer Scotchmate®, Velcro® and Dual-Lock™ fasteners for a wide variety of operating temperatures and degrees of humidity, with or without adhesive backings. Pronat’s re-fastenable solutions replace mechanical fasteners in many applications. SJ3552 Dual Lock™ Reclosable Fastener, 0.22 in ( 5.6 mm) acrylic based PSA with Type 170 white 3M™ acrylic tape and clear polyethylene film liner. High temperature and solvent resistance high shear adhesion, high HSE and low LSE. 230 mil engaged thickness with 170 stems per square inch. SJ3571 – Premium performance PSA nylon loop with acrylic tape and clear polyethylene film liner. 100 mil to 160 mil engaged thickness, 3.5 mil printed liner. SJ3572 – Premium performance PSA nylon hook with acrylic tape and clear polyethylene film liner. 100 mil to 160 mil engaged thickness, 3.5 mil printed liner. SJ3550 – Polypropylene re-closable fastener with white acrylic adhesive on a clear polyethylene film liner with red 3M logo, 250 stems per square inch, 0.22 in ( 5.6 mm).